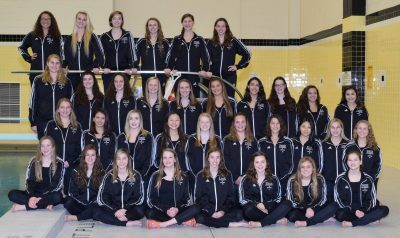 The Penn Girls Swim Team leads the Northern Indiana Conference standings with an 8-0 record in dual meets through Dec. 22. South Bend St. Joseph is second in the league with a 7-1 record. Penn has two meets left, vs. Adams on Tuesday, Jan. 9, and vs. Marian on Thursday, Jan. 11. Penn will clinch the regular-season title with a victory against Adams, since the tie-breaker is head-to-head competition, and the Kingsmen beat St. Joseph 116-70 on Dec. 18. The overall NIC Championship is based on a combination of the regular-season standings and placing in the NIC meet, which is Saturday, Jan. 13.